There are many contestants for the world’s most beautiful vineyard prize, but in our experience, South Africa is clearly 10 leaps ahead of the rest. Its incredible diversity, fascinating history, and stunning beauty make it completely unique. Nowhere is this truer than in the legendary Western Cape. In Stellenbosch (the country’s premier fine wine region) brilliant green pastures sandwiched between the mountains and the sea expand into the breathtaking Franschhoek Valley, with the gleaming white facades of Cape Dutch colonial architecture. The very definition of paradise. But this is only the beginning. 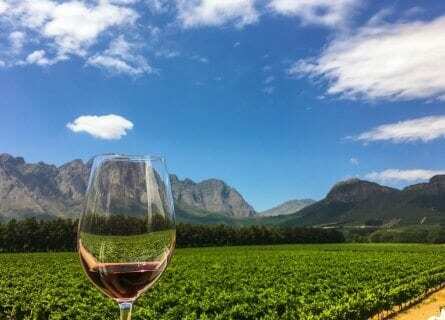 Over the past 20 years, the new generation of younger producers has brought acclaim to once little-known regions such as Paarl, Elgin, and Franschhoek, all of which you will experience on our luxury South African wine tour. Indeed, the wine lover is really spoilt for choice in this part of the world: modern cellars, boutique hotels, stunning landscapes and superlative gastronomy- well on a par with Provence and Tuscany- are all waiting to be explored in the idyllic Western Cape. Legendary and historic wineries such as Vergelegen and DeMorgenzon are massive highlights, in addition to the smaller boutique gems like Painted Wolf. Of course, South Africa offers so much more than fine wines – as delicious as they are – and on this sample private tour you can still expect plenty of free time for sightseeing and cultural activities. A trip to the Kirstenbosch Botanical Gardens and Table Mountain is unforgettable and unmissable, not least because of the unparalleled views, while shopaholics will love the famous Victoria & Alfred waterfront complex. But ultimately, a custom designed luxury experience with Cellar Tours is about you, and we can pack in as many, or as few, activities as you desire. 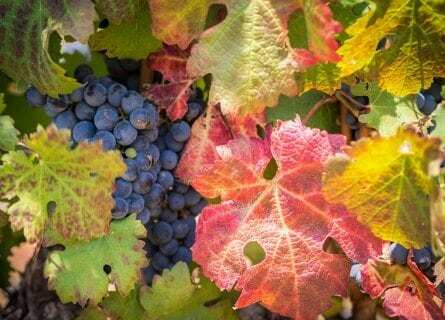 Contact us for more information and we will organize a truly unforgettable stay in this veritable wine paradise! 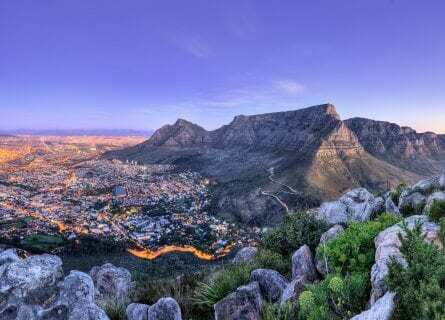 Your unforgettable tour of South Africa starts in the stunning coastal city of Cape Town, where your private driver will be waiting to take you to your luxury accommodation in South Africa’s most dynamic city. Check-in, freshen-up and then enjoy a superlative lunch at the Pot Luck Club, founded by entrepreneur Luke Dale-Roberts. Dubbed ‘Cape Town’s coolest restaurant,’ the Pot Luck Club is all about tapas-style dining, sharing small plates including delicacies such as licorice-glazed sweetbreads and pancetta, peri peri chicken or perhaps beef tataki with a hoisin dressing. Paired with a selection of South Africa’s premium wines, it’s a fitting introduction to your upcoming adventure. After lunch, the choice is yours. Relax at the hotel or visit the Victoria & Alfred Waterfront, Cape Town’s biggest shopping and restaurant complex. Most importantly of all – relax! There will be plenty of time to freshen up before your first wine tasting at the delightful Publik. Dedicated to sourcing wines from sustainably farmed vineyards, a night at this chic bar is the perfect end to your first day in Cape Town. A glass of Le Lude Brut sparkling wine? That will do nicely. For a fine food experience tonight, try Aubergine (Harald Bresselschmidt) or The Greenhouse at the Cellars (Peter Tempelhoff), both highly recommended. Head less than half an hour south this morning, and a scenic drive to the Constantia wine country, the oldest wine region in South Africa. The first vineyards here were planted in the 1600’s and the area is rich in beautiful Cape Dutch architecture. 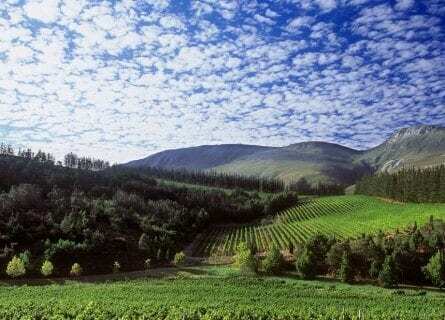 You will visit Klein Constantia, South Africa’s oldest commercial vineyard. While they first came to fame for their delicious sweet wine Vin de Constance from the Muscat grape- still one of their finest wines- today the winery also produces a superb range of varietal wines, including a brilliant Chardonnay and Sauvignon Blanc. 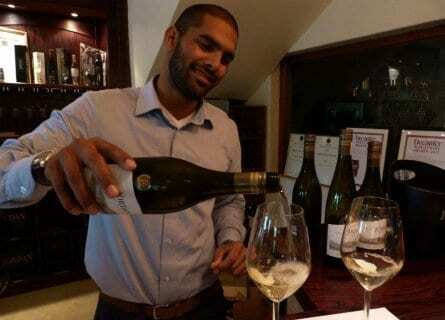 A great introduction to premium Cape wine, you will also get to try the delicious Cap Classique, local sparkling wine. Moreover, talented winemaker Mathew Day will be on hand to answer any questions you may have. Before lunch enjoy another tasting at delightful Beau Constantia, with absolutely stunning views from the tasting room. Ready for lunch? We hope so, as Bistro Sixteen 82, owned by the Steenberg winery, is one of the Cape’s best. Enjoy local dishes in a relaxed bistro setting, paired with a healthy selection of Steenberg’s finest wines. Then, it’s time for the adventure of a lifetime in the Kirstenbosch Botanical Gardens and Table Mountain. The highest point (1,086 meters above sea level) offers the most spectacular views of Cape Town and Table Bay and is totally unmissable. After all that excitement, you will undoubtedly want to relax at the hotel before dinner at one of the city’s leading gastronomic destinations– The Test Kitchen. Owned by Luke Dale-Roberts, the Test Kitchen offers a slightly more formal experience than the Pot Luck Club, where mouth-watering creations such as smoked lamb and barley and toasted ginger wafer are paired with local wines. The ideal recipe for a very memorable evening. Today, your driver will take you to one of South Africa’s most respected wineries – Vergelegen. 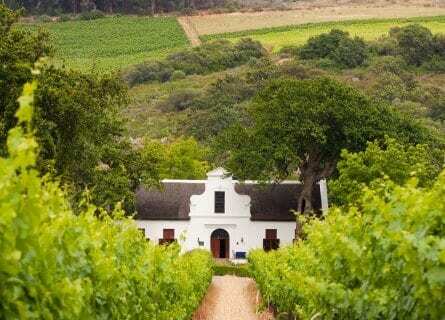 Founded in the 18th century, it is a beautiful and modern estate that today produces the region’s leading icon wine – Vergelegen V. The excellent Vergelegen Shiraz and Chardonnay are other major highlights of your tasting, in addition to a private tour of the winery and cellars. 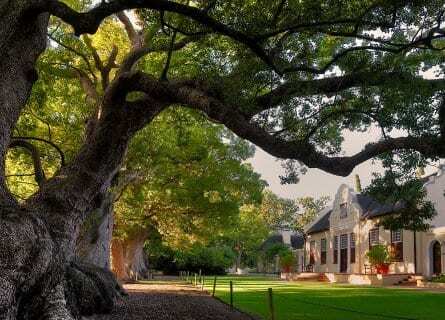 Their manor house dates to 1700 and there are old camphor trees on the estate dating back over 300 years and now considered national monuments. After the tour, enjoy a slap-up lunch at 95 at Morgenster, Giorgio Nava’s world-class restaurant. Its stunning terrace is the perfect foil for Nava’s excellent cooking, must-try dishes include the carpaccio and fish of the day. Truly, you’re in for a memorable feast. You will also enjoy a great olive oil tasting (5 in all) – all grown and pressed in South Africa. These oils are now winning prizes and gold medals in Italy in blind tastings. Try their black and green olives and olive pastes, too. And there are more highlights in store at the boutique Iona winery. Created relatively recently in 1997 by former Engineer Andrew Gunn, it is today one of the Cape’s most beautiful wine farms. Their Sauvignon Blanc is widely considered to be the region’s best, while the elegant, structured Pinot Noir is outstanding. A coastal-facing 5-star luxury hotel is your next port of call for the day, and what a stunning property it is! Situated in the pretty seaside town of Hermanus southeast of Cape Town, it boasts exquisite design, attentive service and a pampering spa to die for. Spend a few hours relaxing before a memorable dinner at the restaurant, where fresh fish cooked to perfection is the order of the day. Paired with local wines and stunning views of the coastline, it simply doesn’t get any better than this. After breakfast at your idyllic beach hotel, you will enjoy 2 visits to leading wineries in Hermanus – Almenkerk and Paul Cluver. Almenkerk is a family-run estate of the highest quality, and a testament to the remarkable terroir of the Elgin region. 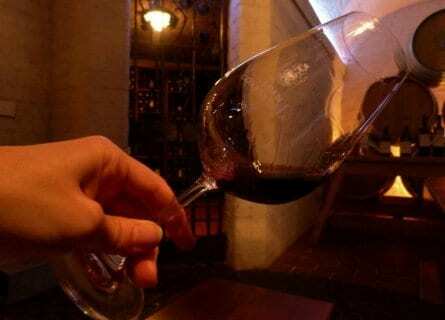 Their range of wines is outstanding, particularly the Syrah and vineyard selection, a funky blend of Syrah, Merlot, Cabernet Sauvignon, Cabernet Franc and Viognier. It is one of the Cape’s most outstanding reds. The second visit is at Paul Cluver, a legendary name on a mission to craft the finest wines from sites that truly express their terroirs. Specializing in cool climate style wines, Paul Cluver has been family-run since the end of the 19th century, and today produces a venerable range of whites and reds. The Pinot Noir is one of our favorites in the Cape, which, of course, you will be able to try in addition to the excellent Riesling and Seven Flags Chardonnay. One of the unmissable highlights of your South African wine tour. Lunch is served at Paul Cluver’s signature restaurant, Fresh. Expect friendly, warm service and tasty local dishes prepared with passion and flair. Afterward, the day is yours. In September or October your hotel can organize whale watching excursions, otherwise, relax and enjoy the spectacular scenery. With a glass of wine, of course. 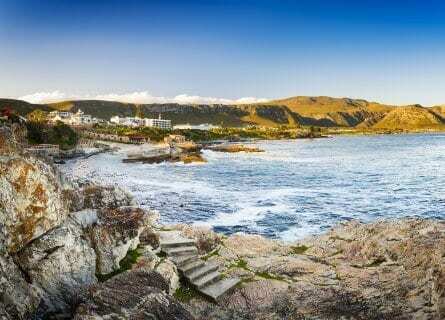 This morning, you will have the chance to get better acquainted with the delightful resort of Hermanus. A pretty village, it boasts a fascinating harbor museum in addition to the natural beauty of its famous cliffs, perfect for whale spotting in season. A walk along the cliffs in September or October often provides amazing views of the Southern Right whales, a common sight in Hermanus during the fall. After your excursion, head to La Pentola for an exquisite lunch with the best sea views in town. Specializing in mouth-watering fusion cuisine, their Thai Green vegetable curry is (we think) the region’s best. The wine list is no less impressive and provides useful introductions to South Africa’s leading regions and grape varieties. It’s time to bid farewell to Hermanus and head north to Franschhoek, where your luxury accommodation awaits. It is a stunning property, with service to match. We don’t want to spoil it too much, but let’s just say you’re in for a major treat. Check in, relax and enjoy. Welcome to Paarl! This special town is the third oldest European settlement in South Africa and its second largest wine region, today producing wines of superlative quality. The adventure begins at Painted Wolf Wines, a family tale founded by Jeremy and Emily Borg in 1997. A fun loving couple, they’re the perfect hosts and will introduce you to a range of their very special wines, including our favorites The Den Sauvignon Blanc and the famous Pinotage Black Pack. Next up is Glen Carlou, established in 1985. With its views of the majestic Drakenstein Mountains, an exciting modern art collection, and delicious wines, Glen Carlou is an undisputed highlight of your bespoke tour. Taste their outstanding collection of fine wines with winemaker Arco Laarman, including one of South Africa’s leading whites, Quartz Stone Chardonnay. A beguiling glass, full of tropical fruit and toasty oak, it’s simultaneously refined and expressive. Glen Carlou will prepare a sumptuous lunch next, to see you through to dinner. In the afternoon you will have time to explore Franschhoek at leisure. One of the oldest towns in South Africa, Franschhoek was settled by Huguenots (Protestants) in the 17th century and is today considered one of the Cape’s most prosperous towns. Apart from the stunning scenery, the local Huguenot museum is well worth a look, documenting the settler’s history in this part of the world. Then, after a well-earned rest prepare for a gastronomic experience at La Colombe at Le Quartier Francais tonight, incredible! Can there be a more beautiful place on earth to spend the day than the captivating Franschhoek Valley? Today, you will discover the many highlights of this special region, including tours at Chamonix and La Motte wineries. Chamonix, your first stop, is far more than a winery – it offers chic accommodation, a great restaurant and an underground cellar that is very popular with visitors. Head winemaker Thinus will guide you through his brilliant selection of wines, our personal favorite being the always delicious Reserve white, a blend of Semillion and Sauvignon Blanc. Your second visit to La Motte will afford you the chance to try one of the Cape’s most highly regarded wines – Hanneli R. A blend of Tempranillo, Petit Syrah and Syrah, it’s a structured, powerful wine of remarkable intensity. The perfect foil for the excellent cuisine served at La Motte’s restaurant, where you will have lunch today. The afternoon is yours to do with as you please. Sit back, relax and enjoy the famous hospitality of your hotel. Dinner is at The Kitchen, a superlative den of gastronomy run by legendary chef Arno Janse van Rensburg’s. An advocate of farm-to-table cooking, the vast majority of his produce comes from the neighboring farm, ensuring that the ingredients are as seasonal and fresh as can possibly be. Truly, this is one of South Africa’s greatest restaurants. After a sumptuous breakfast, get ready for a spectacular finale to your South African odyssey. We have arranged a special tasting at DeMorgenzon, run by the dynamic duo Hylton and Wendy Appelbaum. The farm is situated high above the valley, affording visitors amazing views across to Table Mountain, taking in the grand sweep of the bay. Hylton is something of a pioneer and plays baroque music to his vines 24/7. It’s not just a gimmick, though, as a tasting of their excellent wines will prove. The Reserve Chenin is arguably the finest made in the Cape. What follows is another great tasting at neighboring Jordan winery, run by Gary and Kathy Jordan since 1993. It’s a beautiful and historic farm renowned for its powerful, meaty Syrah and the supremely elegant Nine Yards Chardonnay. The restaurant at Jordan is owned by George Jardine, one of the top 10 chefs in the country. Lunch will follow, and what a farewell lunch they have in store! Expect smoky, smoldering country flavors in simple combinations on a contemporary plate – with signature smoked yellowtail, steamed Saldanha mussels, seared ribeye and springbok pot roast up for grabs. All accompanied, of course, with a selection of Jordan’s brilliant wines. Take the afternoon off from wine tasting and stroll around the beautiful town of Stellenbosch. Its stunning architecture is a result of the Cape’s Dutch heritage and today Stellenbosch is celebrated as both as a center of agriculture and as a center of learning. The region’s first university was inaugurated in 1918 – to this day it remains an internationally recognized education center and one of the leading universities in Africa. After your stroll, return to Franschhoek in the late afternoon and take advantage of a last free evening to enjoy a great meal and relax. Your private driver will take you to the airport in Cape Town today for your outbound journey. Have a safe journey home and see you again soon!